Mark Trebley can turn any story, no matter the topic, into a great yarn. An essential skill when he’s talking to communities and health professionals in rural and remote NSW, educating them on acute rheumatic fever (ARF) and rheumatic heart disease (RHD). 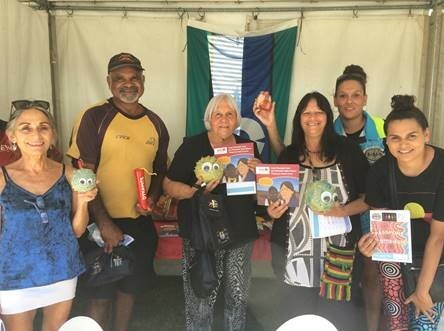 We met Mark when he called RHDAustralia early this year seeking advice and resources for the booth and puppet show he was preparing so he could educate attendees at the Albury Wodonga Aboriginal Health Service “Passport to Better Health’ day on ARF and RHD. When Mark told us what he was doing we were immediately supportive. “I’ve got a couple of Strep A bugs I made up using some painted polystyrene balls, some hot glue, a bit of paint and some googly eyes for good measure, “ Mark said. Then I’ve got my penicillin - which I’ve crafted to look like a stick of dynamite. I was a bit worried at first about the dynamite/penicillin analogy and blowing up the Strep bugs but, I’ve found people always get a good chuckle from it,” he adds. Needless to say, we sent Mark some Aunty Mary story books, bookmarks, and Fast Facts flyers, to accompany his puppets. A representative of the NSW Ambulance Aboriginal Cardiac Care Awareness program, Mark travels right across NSW delivering education and training to communities and health professionals. 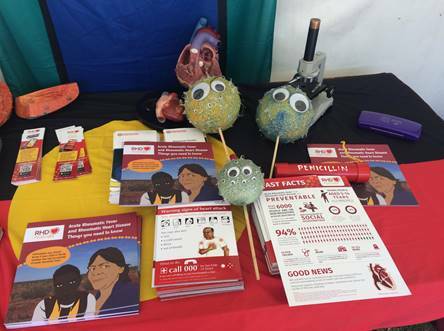 The Aboriginal Cardiac Care Awareness program was set up to address the high number of cardiovascular incidences taking place across NSW for Aboriginal people. For the past four years, Mark has provided education and training to thousands of Aboriginal people living in the rural and remote communities of NSW. In the past, most of his focus was on recognising heart attacks and the more traditional cardiovascular disease. That was, until the beginning of this year. “I received a request from NSW Ambulance Service to include ARF and RHD in the discussions,” Mark says. To date, Mark has provided hands-on ARF and RHD education to over 300 Indigenous Australians including most recently, a group of paramedics based in the small outback town of Lightning Ridge in northern NSW. While there, he used the opportunity to engage with several Aboriginal health workers and childcare representatives. Mark also met with members of the Lighting Ridge Elders group. “We always try to respectfully engage with the community Elders to share the knowledge with them first. This allows the Elders to provide input and guidance as how to deliver the knowledge in a culturally appropriate and safe manner. Permission is sought from the Elders for the engagements to proceed in their communities,” said Mark. Through these engagements, Mark gets to hear firsthand how ARF and RHD are impacting residents in the community. “And just recently I learnt of a local family of five all with varying degrees of RHD. I didn’t know how much of a problem it was until I started talking with people in the communities”, Mark tells us. Our thanks to Mark for reaching out and sharing his experiences. The NSW Ambulance Cardiovascular Unit is working towards developing a sustainable delivery model for this program ensuring the success achieved so far continues as we provide this valuable education to Aboriginal communities. We look forward to hearing more as Mark travels around rural and remote NSW delivering education and training to health professionals and communities. And we applaud NSW Ambulance for their focus on acute rheumatic fever and rheumatic heart disease. We’re hopeful there’s a growing movement underway to make ARF and RHD education more of a priority throughout the health system.